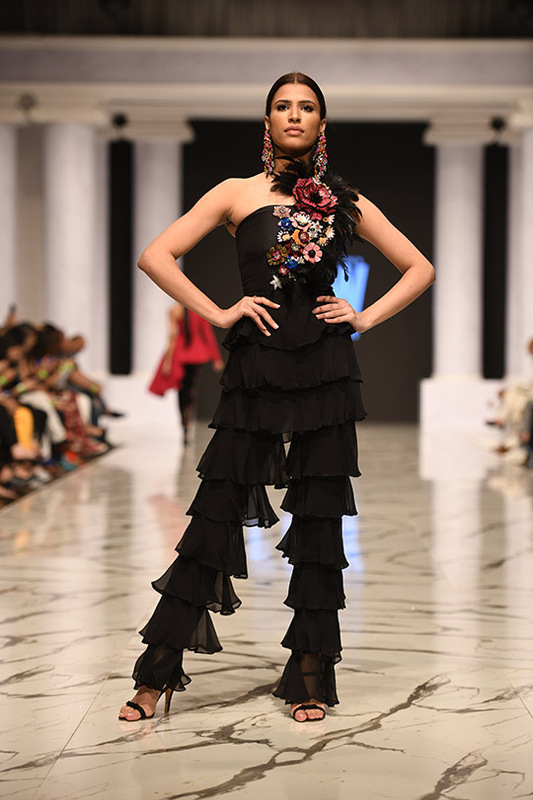 With every Pakistani Fashion Week, we see breathtaking collections that meticulously tell a story and set a mood for the audience that eagerly wait to be dazzled. 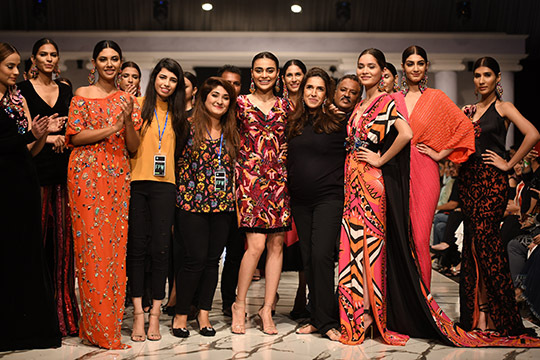 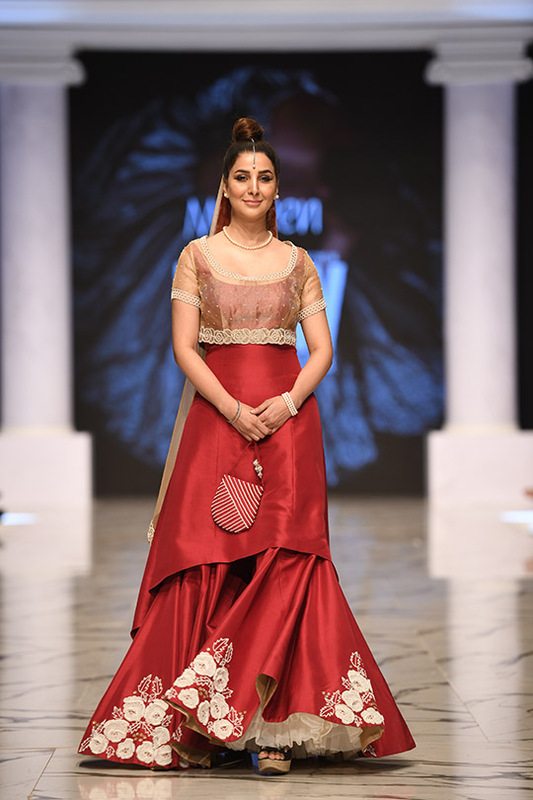 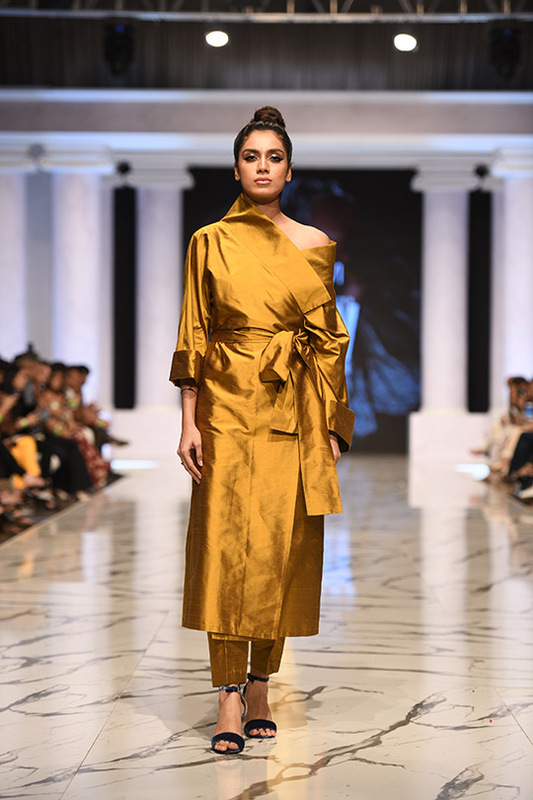 The second day of FPW featured some of the nations most loved designers that either payed homage to the antique and traditional techniques or used the runway to advance to a new level of fashion forward thinking. 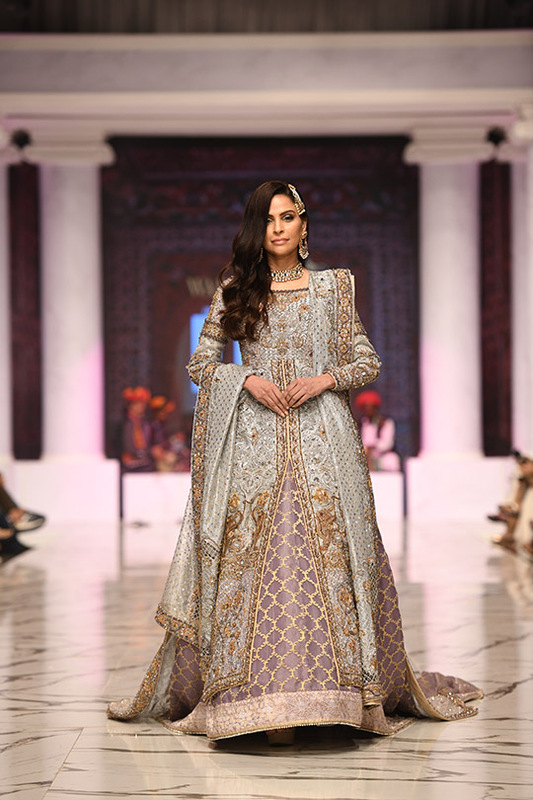 From Wardha Saleem’s antiquated bridal collection, to Maheen Karim’s sparky party wear, to Rano’s Heirloom with their subtle florals to the reigning Queen of fashion – Maheen Khan’s take on the empowered woman of today. 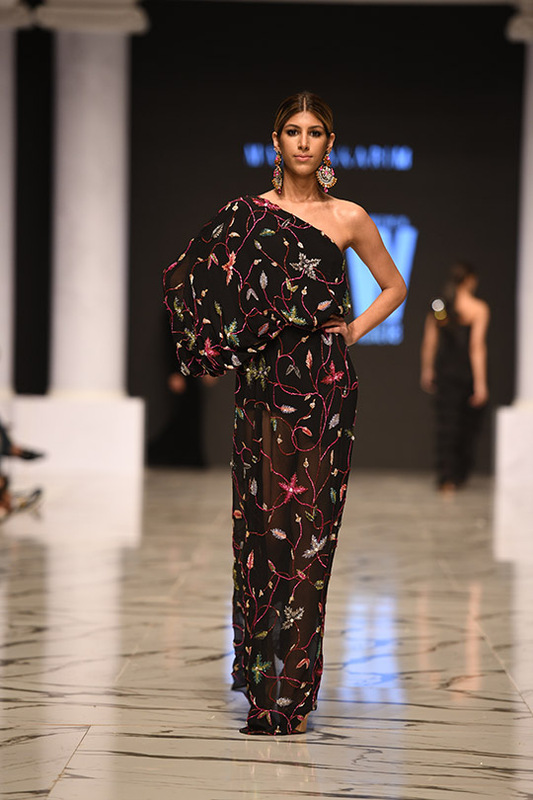 It’s safe to say we were left starry eyed after each dynamic collection! 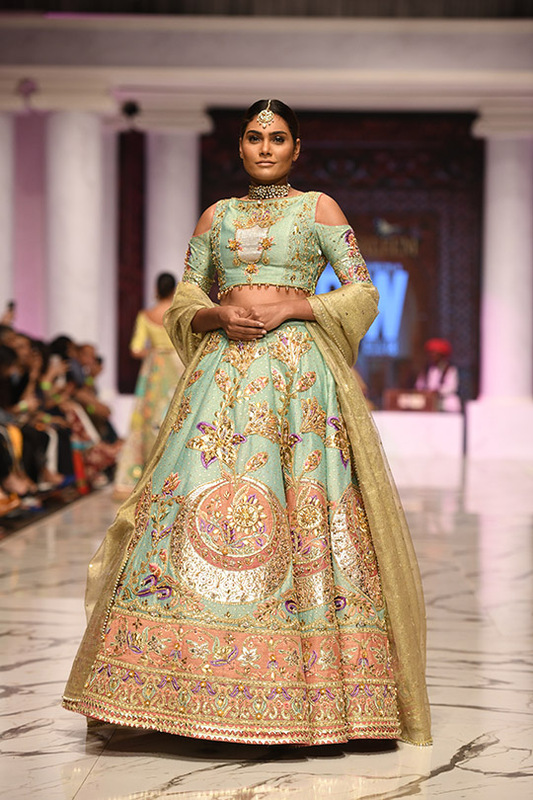 We can always expect Wardha Saleem to grace the runway with a bedazzling bridal collection. 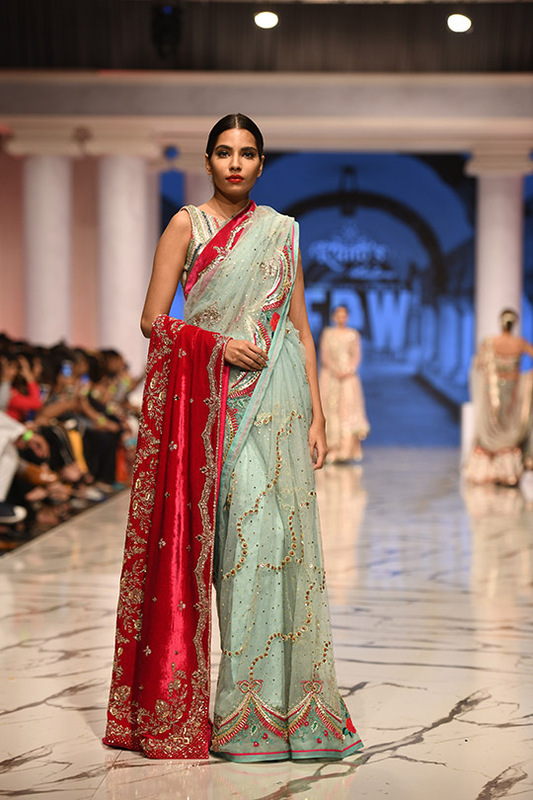 Accompanied with rich folk music from singing legend Ma Dhai, each model glided with the melody. 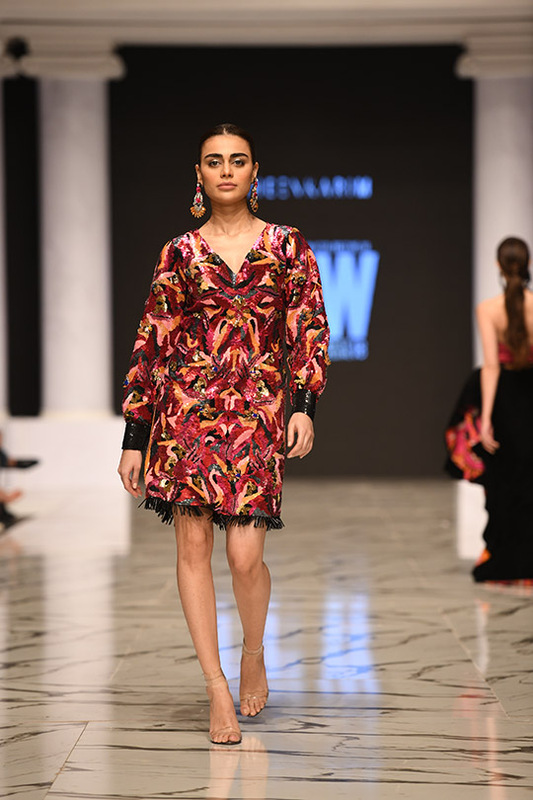 From twirls that left the audience gasping for air, to a runway love story between showstoppers Azfar Rahman and Sohai Ali Abro, the first show of day 2 started off with a bang! 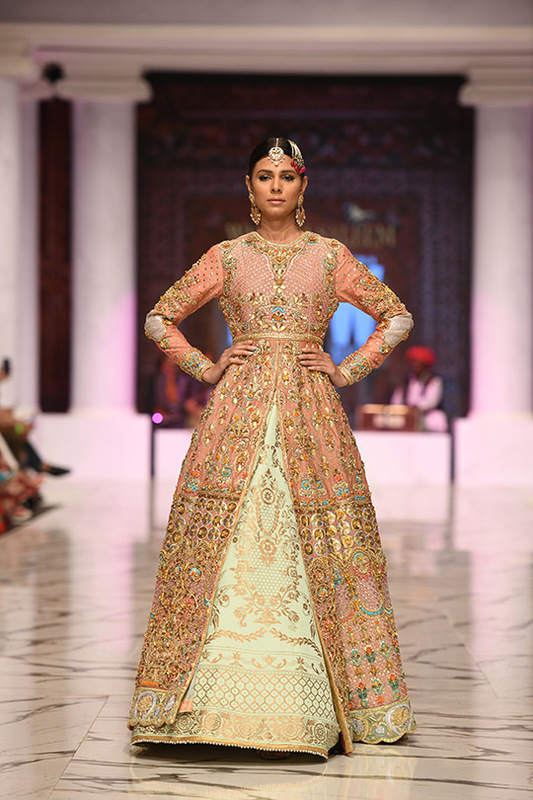 Inspired by the eminent time of the Sub-continent and the Mughals, “Chandbala” was rich in heritage. 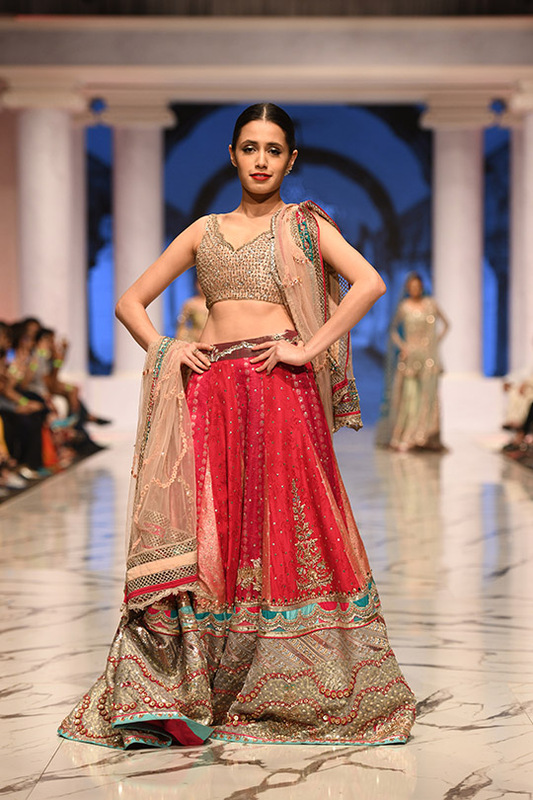 From using fabrics such as pure silks, jamawars, hand-woven nets, velvet and digital printed silks and organza’s and embellishing them with zardozi, Swarovski crystals and kora dabka – each lehenga and sari was literally everything a bride to be could ask for! 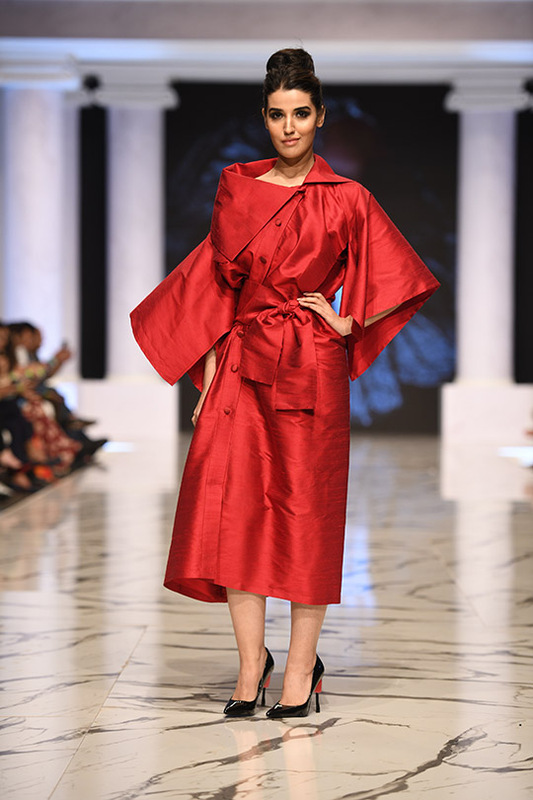 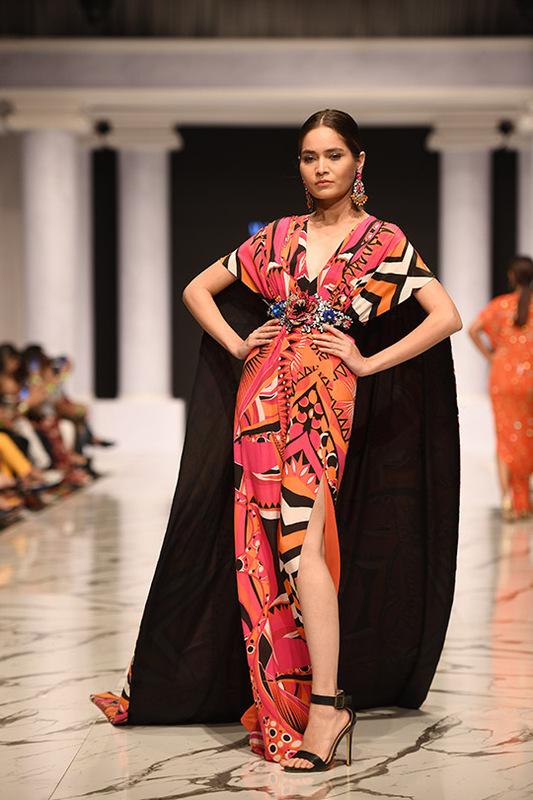 It’s safe to say Maheen Karim knows how to transport the West to the East. 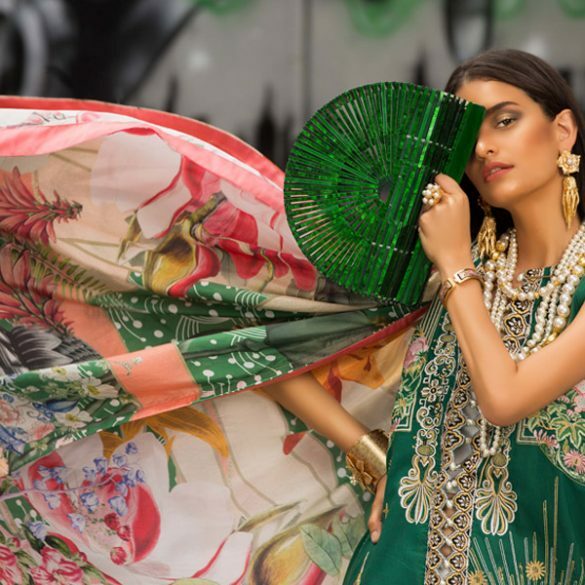 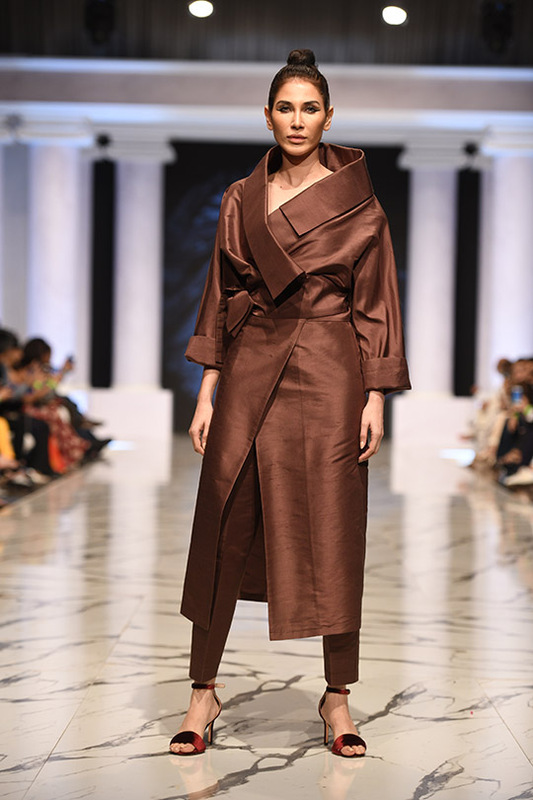 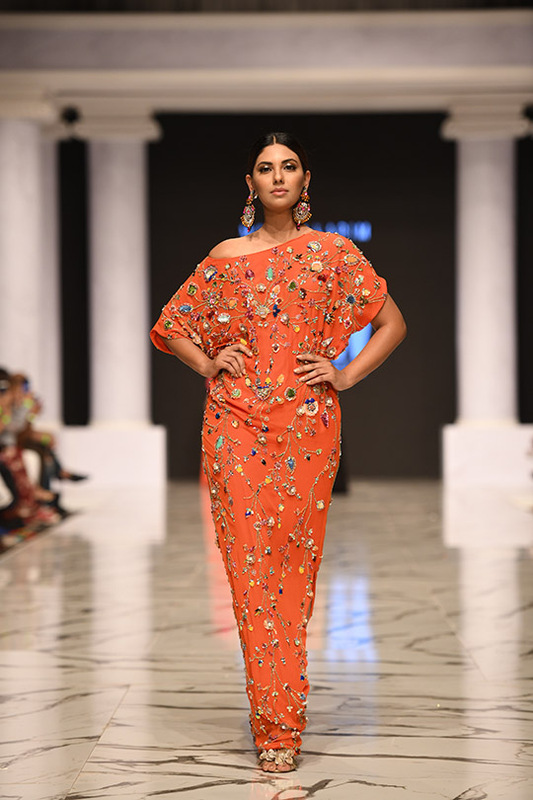 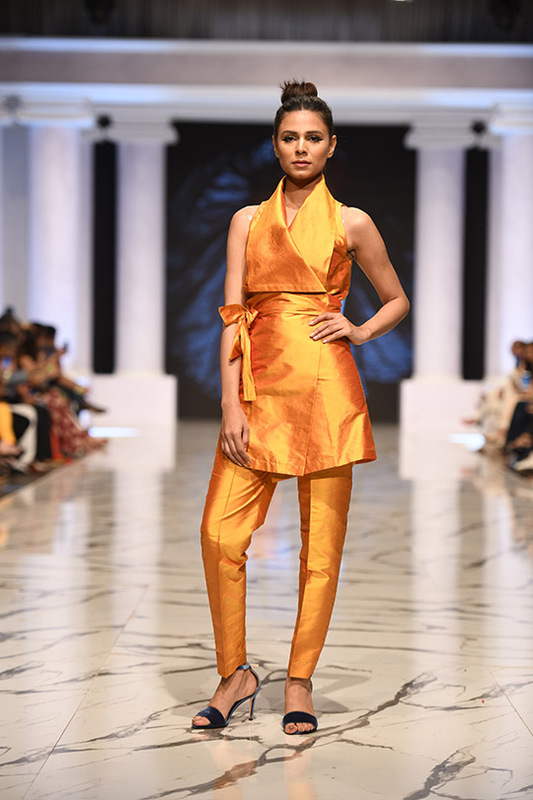 With her festive collection, Lueur De Luxe, Maheen upped the ante with edgy silhouettes that featured loud two piece suits, detailed and shimmering dresses and glamorous trouser suits that guarantee every woman adorning them to stand out in a crowd. 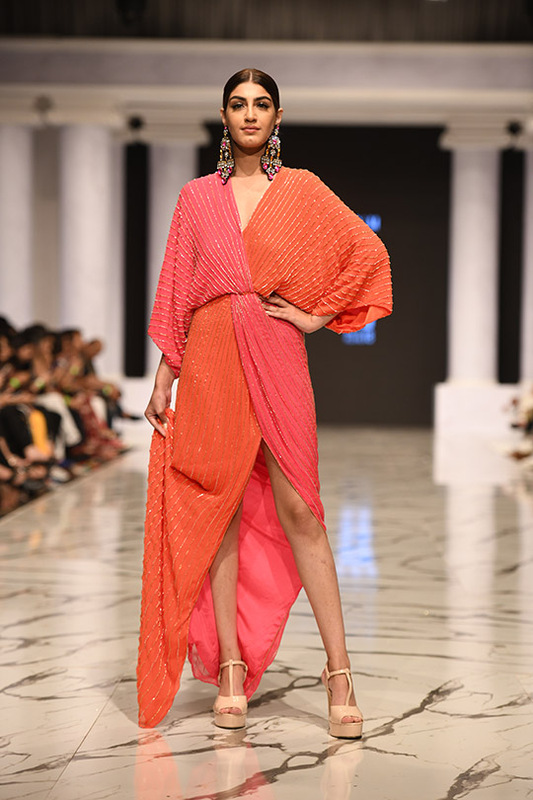 We adored the color schemes that were chosen for this collection – from reds to coral and tangy orange! 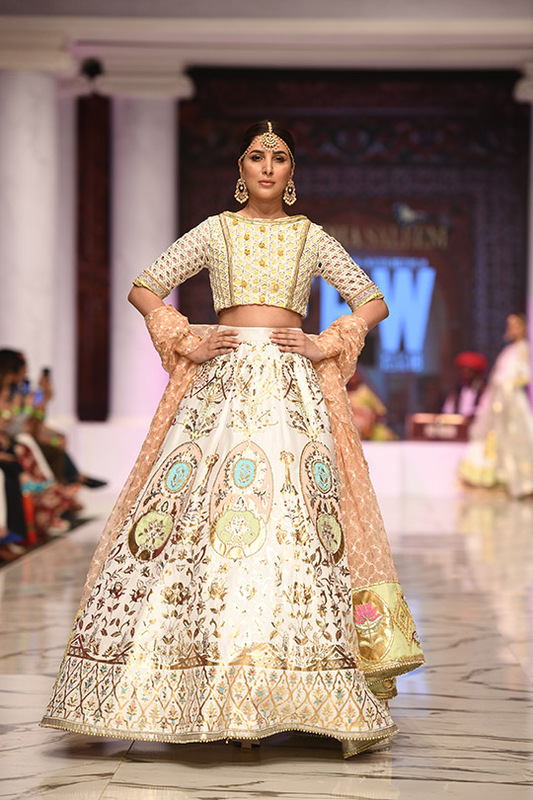 The fabrics used were her trusted chiffon and decorated with three dimensional embellishments. 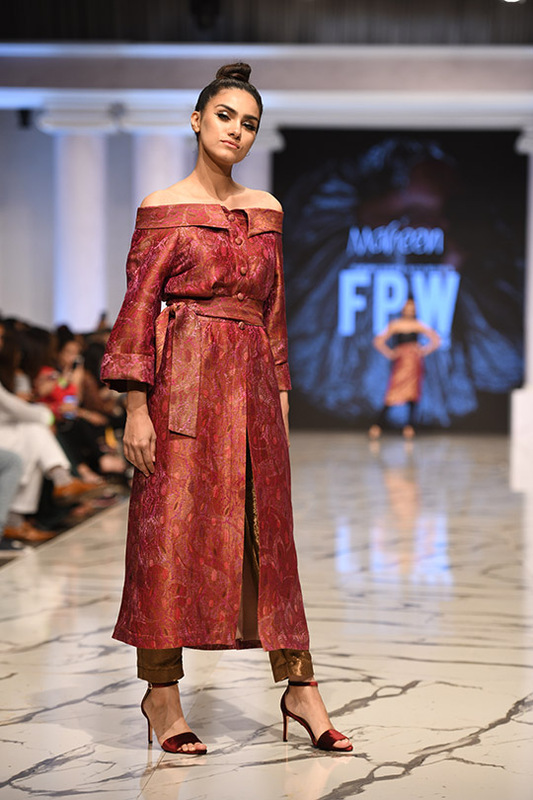 It was as if Maheen singlehandedly transported us to France, and we didn’t mind that at all! 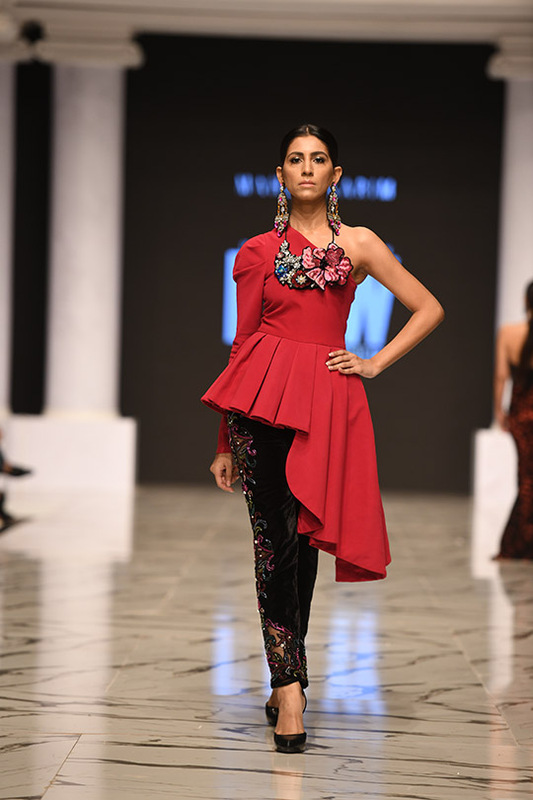 Bold designs as well as feminine elegance. 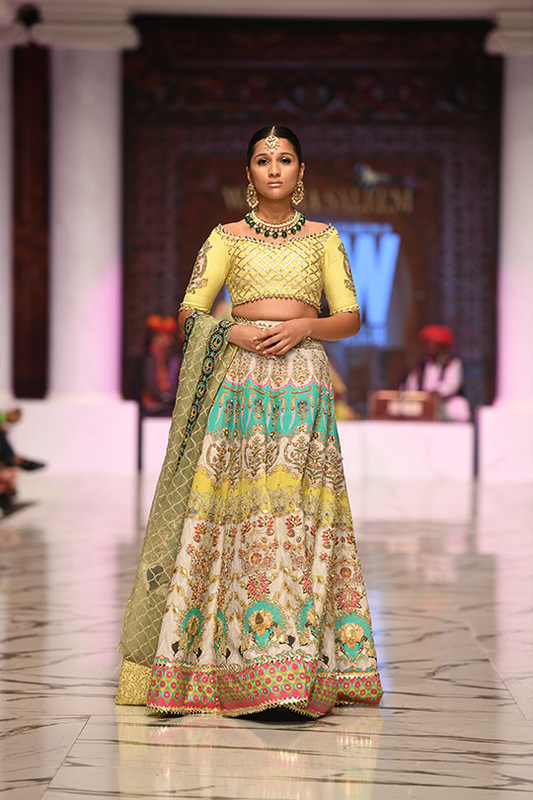 All in all, a fantastic collection that we would definitely rock! 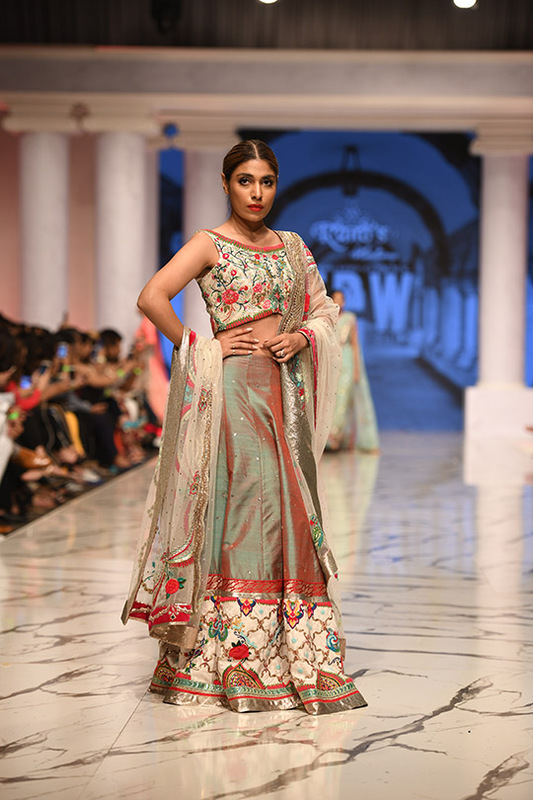 Rano’s Heirloom remained true to the brands name with her collection, Phool Bunro. 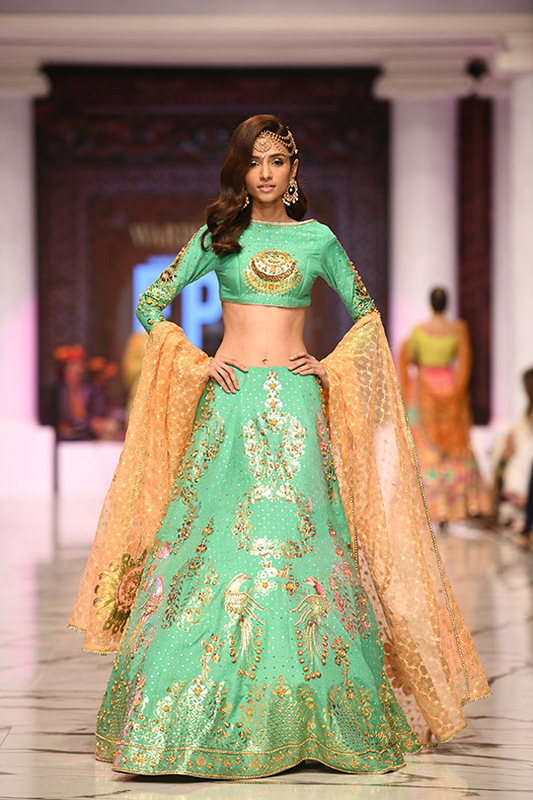 It brought back the simplicity of being a bride in the most graceful fashion. 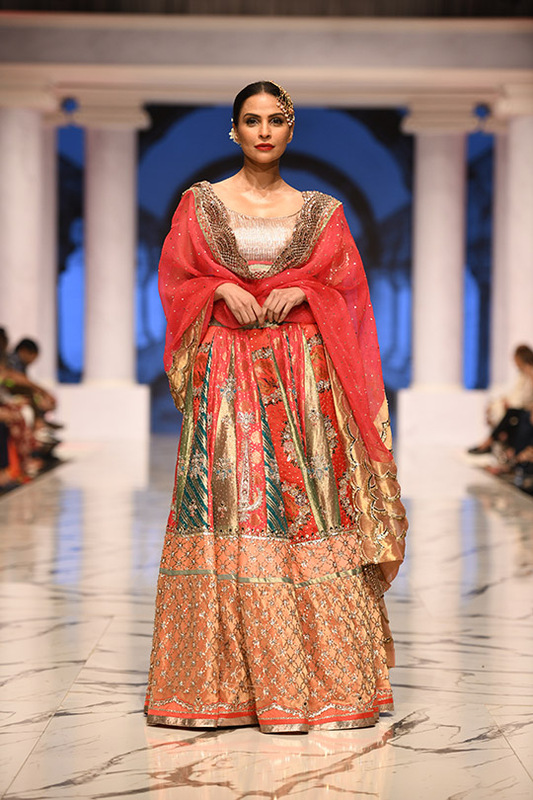 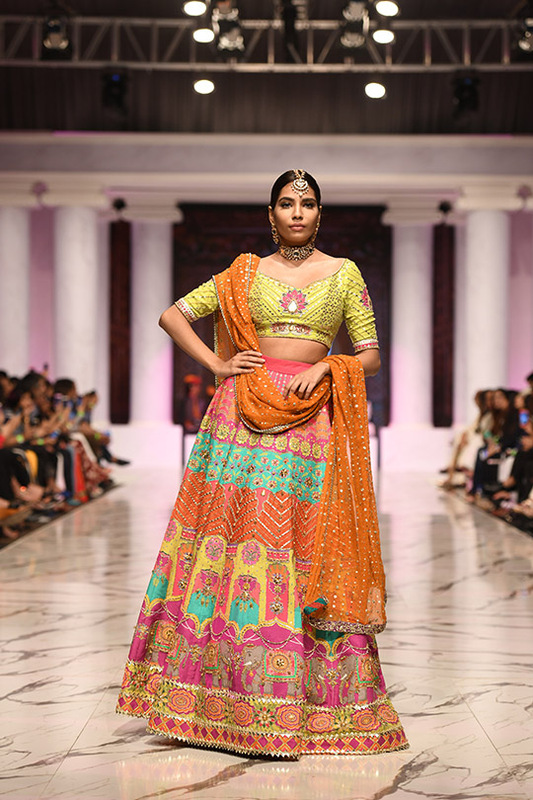 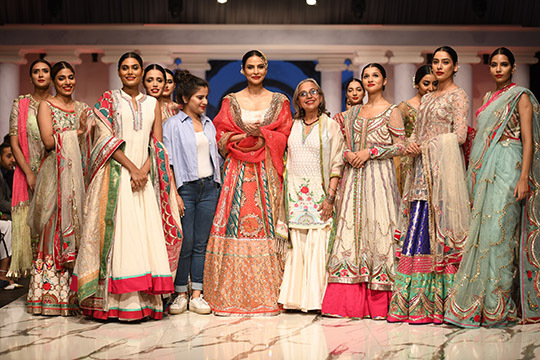 Using a color palette that was rich in blues, pinks and zeher mora and combining them with embroidery mixed with gold and silver, the collection featured statement bridals that any woman would pass down to her daughter at the time of her marriage. 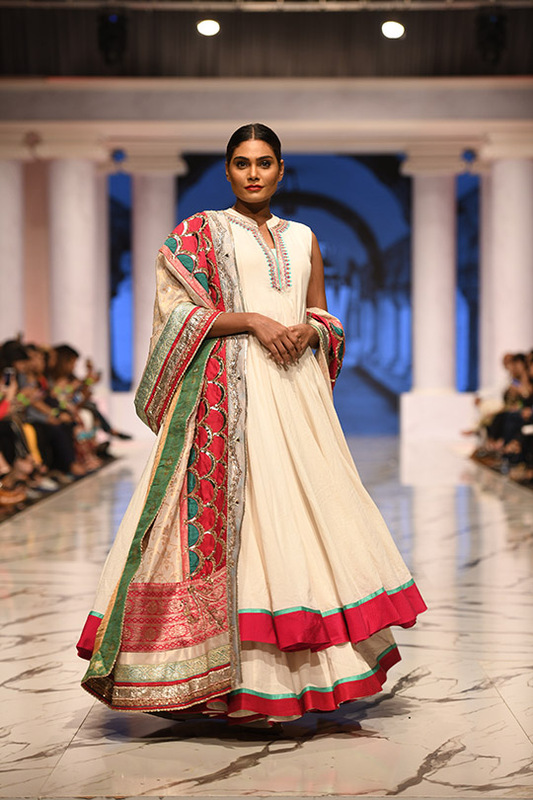 Hence, staying true to the Heirloom part of the brand’s name. 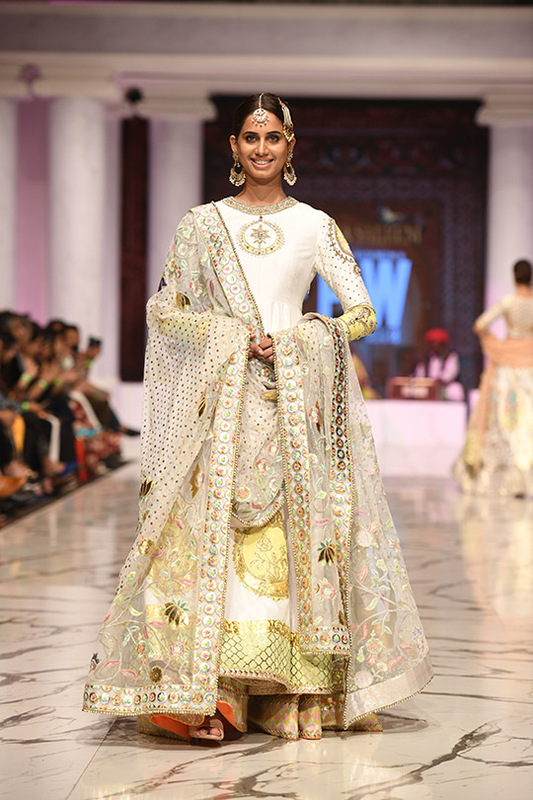 Rich in tradition and true to the past, each bridal was fluent in elegance. 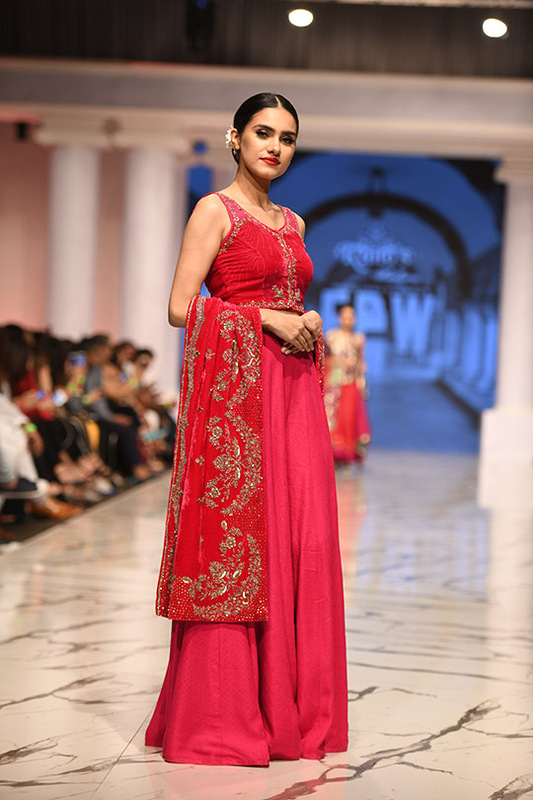 The audience applauded the revival of a time where happiness and love are at their best. 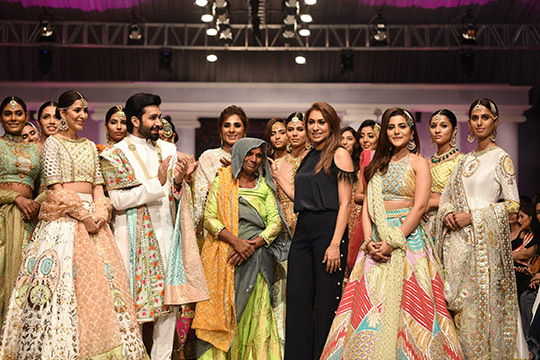 If there’s one thing the reigning Queen of fashion knows, it’s how to empower women with fashion and lending a voice to a movement that is in need. 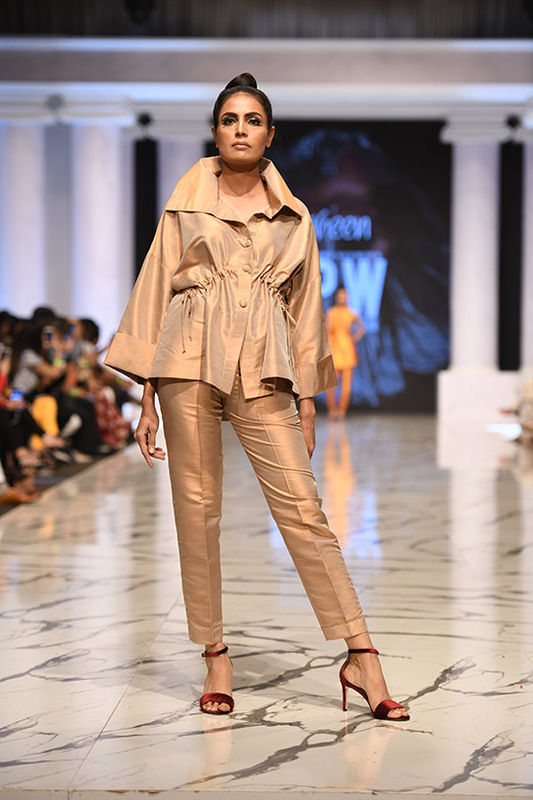 RAW by Maheen Khan spoke to the millennial women of today who are leaders and progressive thinkers. 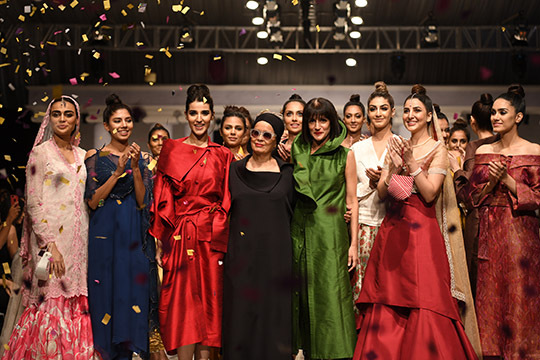 Women who struggle and persevere to reach their end goal. 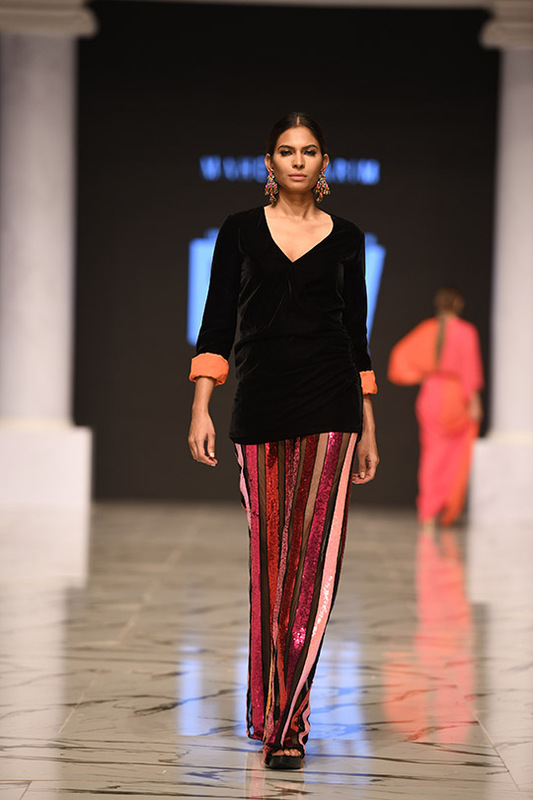 It was a collection that featured contemporary cuts and delicate silhouettes. 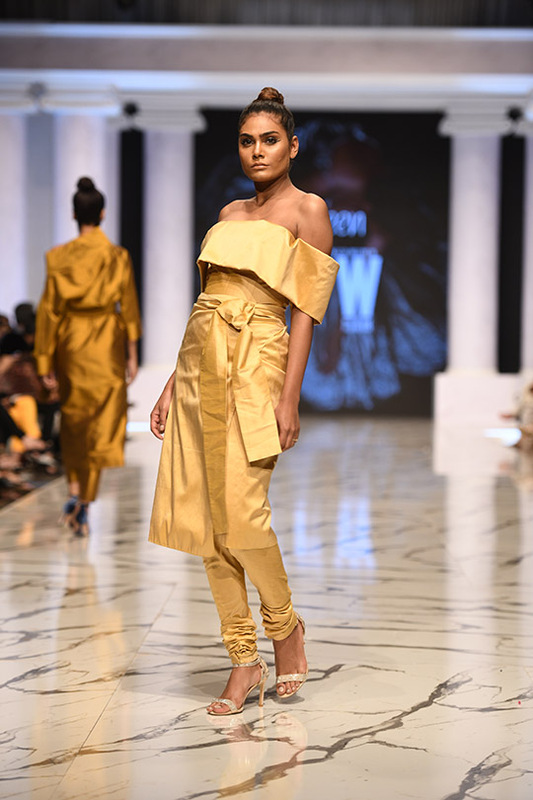 Any boss woman in the audience vibed with each outfit, and it’s no surprise that the woman behind it all was someone who constructed a movement in her time. 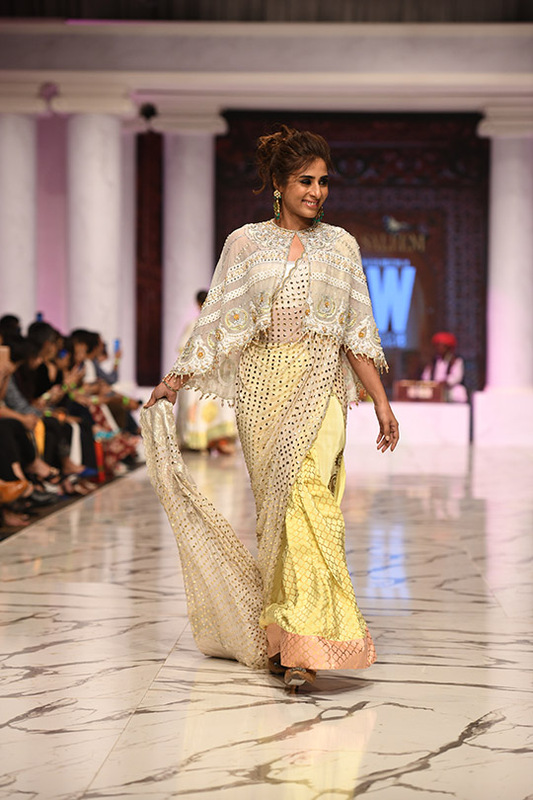 All in all, the closing of day 2 was magical and chic – in true Maheen Khan fashion! 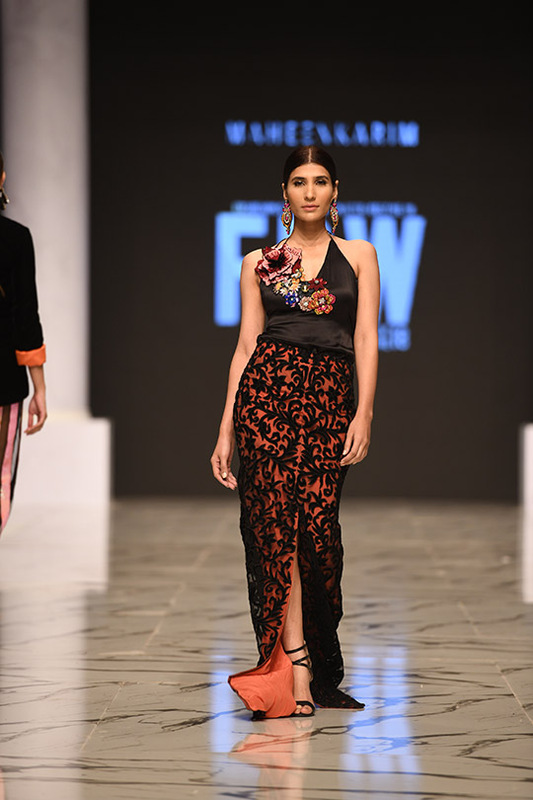 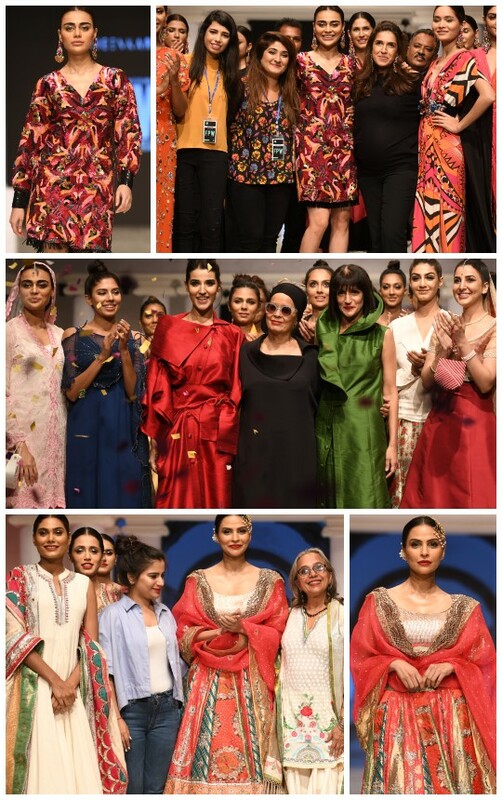 Project Runway: FPW'18 Day 1 Top Picks- Tena Durrani, Lajwanti, Zainab Chottani & HSY!